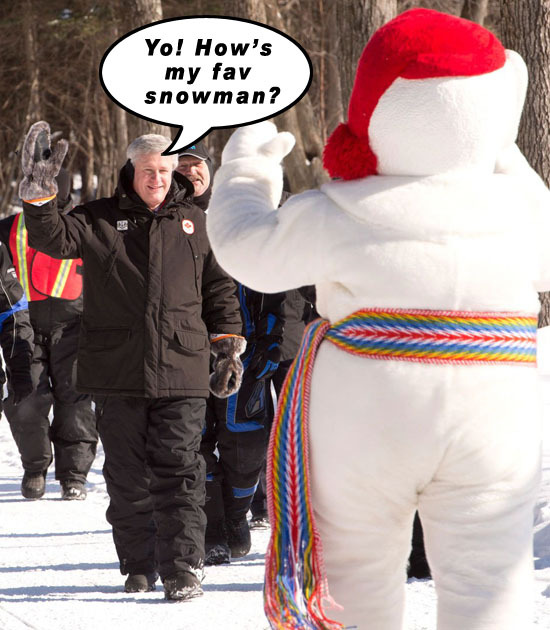 But only minutes later the Prime Minister caught Bonhomme by surprise when he viciously kicked him in the stomach as he accused Bonhomme of being in league with Canadian scientists. It's well known that Canadian scientists have been repeatedly muzzled on the subjects of climate change and other environmental concerns during Harper's time in office. "Harper has tightened control over what scientists tell the press, and when. A leaked internal analysis from Environment Canada in 2010 found that media coverage and requests on climate change fell sharply over three years. 'Media coverage of climate change science, our most high-profile issue, has been reduced by over 80 per cent,' the document said." In 2014 The Climate Change Performance Index (published annually by Germanwatch and Climate Action Network Europe) labelled Prime Minister Stephen Harper and his Australian counterpart Tony Abbott the "earth's worst climate villains." 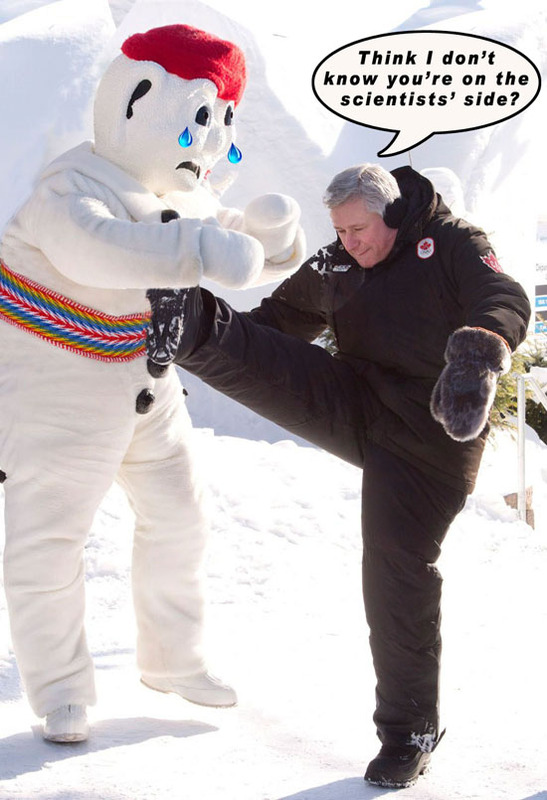 Moments after Friday's unsportman-like attack, Bonhomme, having recovered from his initial surprise, wrestled Harper to the ground and dunked his face in the snow several times. "That's from the polar bears," Bonhomme reportedly declared in French. He was quickly restrained by RCMP who pulled the Prime Minister to safety.